Novel Concepts really live up to their name, as the company has come up with what they tout to be the thinnest forced convection (fan cooled) heat sink in the world. This successful development has patents pending for it, and you will be surprised to hear just how slim it is. Ready? Take out your wallet from the back pocket, and check out your stack of credit cards. Those are quite thin by any standards, right? Well, the ThinSink is thinner than that just to give you a better idea. This low-profile ThinSink will boast of a volumetric cooling efficiency that is 25 times greater than today’s best microprocessor heat sinks, and to put it in layman’s terms, it will cool 25 times more heat per cubic centimeter. Specially developed to fit inside small electronic devices that range from notebooks to monitors and tablets, ThinSink is able to efficiently cool integrated circuits, semiconductors, LEDs and other microelectronic heat generating devices. ThinSink’s smooth fan surface will not sip up too much juice at all – on the contrary, it will consume a mere 0.031 watts of electricity (that means up to 2 days of non-stop whirring on a single AAA battery). The credit card-sized ThinSink (85mm x 55mm x 0.75mm) will rely on a 40mm diameter smooth fan that spins at 6,000 RPM, and yet is able to achieve an amazing thermal performance of 2.73 degrees Centigrade per watt at a fan speed of 6,000 RPM. Despite being super thin, it won’t wake up the dead – it is extremely quiet thanks to its thin, smooth fan surface, where it will do away with the pulsating sound and vibration that is caused by traditional fan blades. 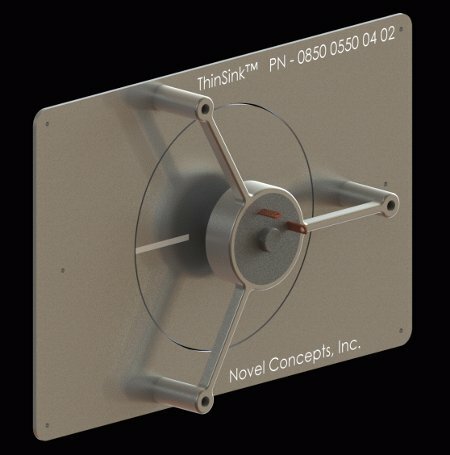 At 6,000 RPM, the credit card-sized ThinSink will feature a sound output of less than 34 dBA (that is quieter than a soft whisper at one meter distance if you need a comparison). The Ikea-inspired flatpack idea will also be lightweight, tipping the scales at a mere 13.8 grams (motor included!) while occupying just 4.5 cubic centimeters of space. Not only that, the ThinSink might just be the most cost effective thing in your computer setup to date. We look forward to seeing future devices that have the ThinSink running inside.